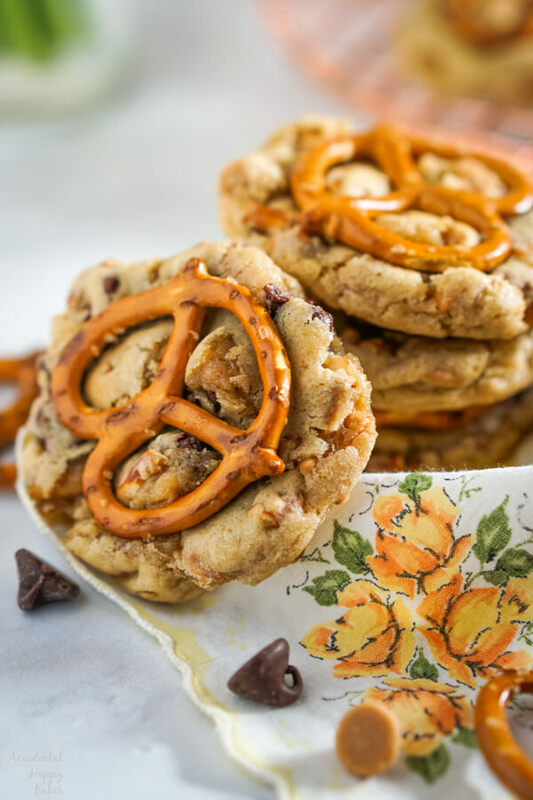 Peanut butter and pretzel chocolate chip cookies. Whew, that’s a mouthful. A delicious chewy, crispy, crunchy, sweet and salty combination. And a really long title for a cookie recipe. How do you feel about sweet and salty dessert combos? I’ve been in love with them ever since 5th grade when I first tried Strawberry Pretzel Salad. If you like a little bit of salty with your sweets then you are going to love these cookies. 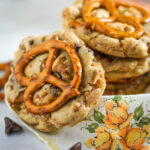 The base recipe for these peanut butter and pretzel chocolate chip cookies is pretty much just like a chocolate chip cookie. Made with a combination of white sugar, dark brown sugar and butter these cookies are soft and chewy, but have lovely crisp edges. 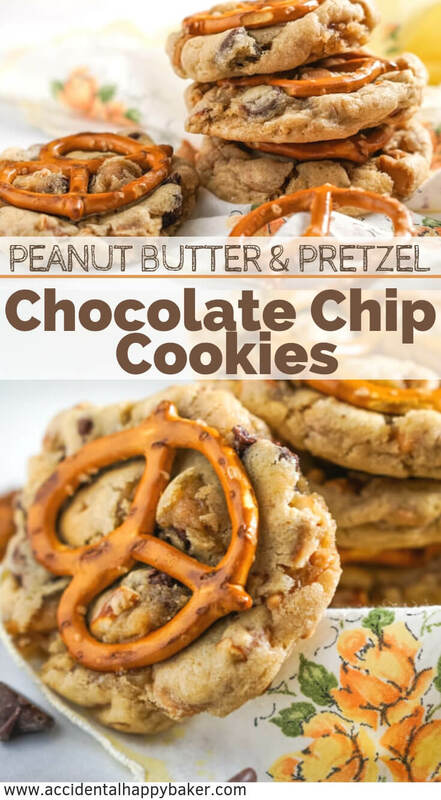 The insides of the cookies are loaded with chocolate chips, peanut butter chips and crushed pretzels. What kind of pretzels should I use? I suggest using tiny pretzel twists for these cookies, because then you can press them into the tops of the freshly baked cookies. They look fun and it adds extra crunch to the cookies. However, you can use any kind of regular thin and crispy pretzel, like pretzel sticks or regular pretzel twists. Can I substitute a different flavor of chips for the peanut butter chips? Yes! 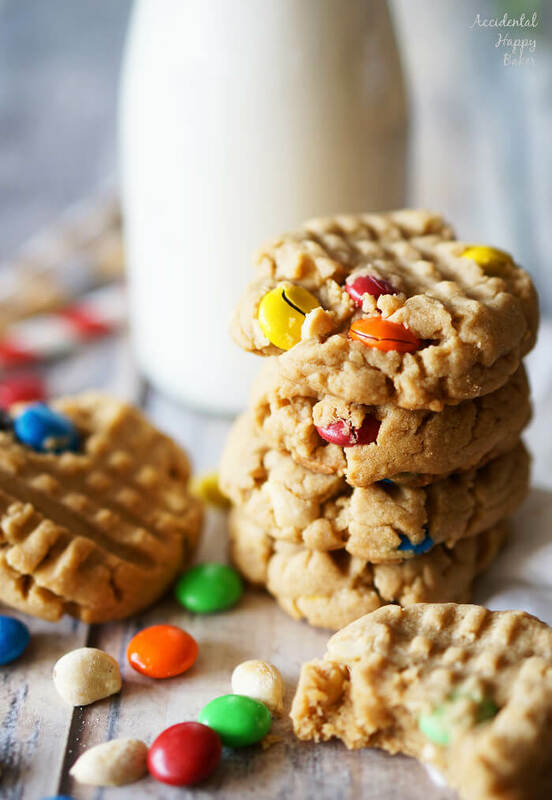 Butterscotch chips, caramel chips, and toffee bits all make great substitutes for the peanut butter chips in this recipe. Or, if you’d like, you can even use all chocolate chips. 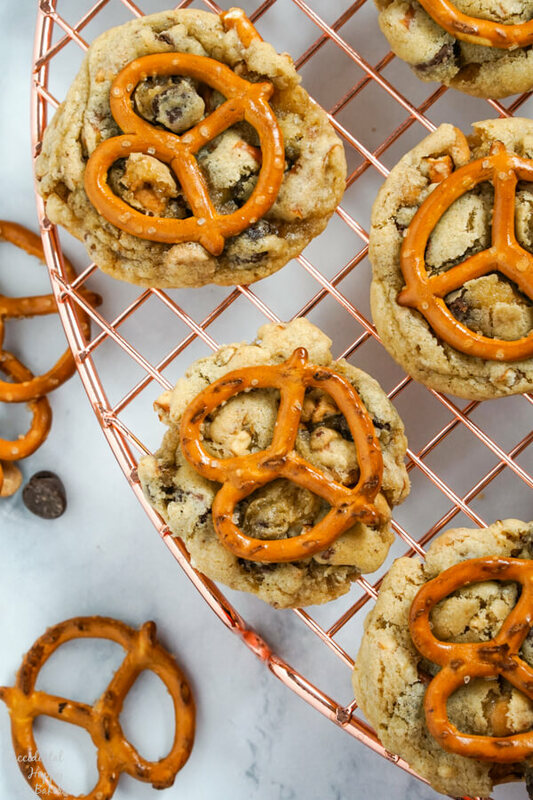 The cookie dough for these peanut butter pretzel chocolate chip cookies doesn’t require any chilling time. Just mix, bake and go! I will give you one more bit of advice though. You know how often times you will add a slice of bread to the cookie jar to keep your cookies soft and fresh? This is one cookie you don’t want to do that with. The pretzels will get soft and spongy, which kind of ruins them. But you probably won’t have any of these cookies sitting around long enough to worry about needing to keep them fresh anyway! 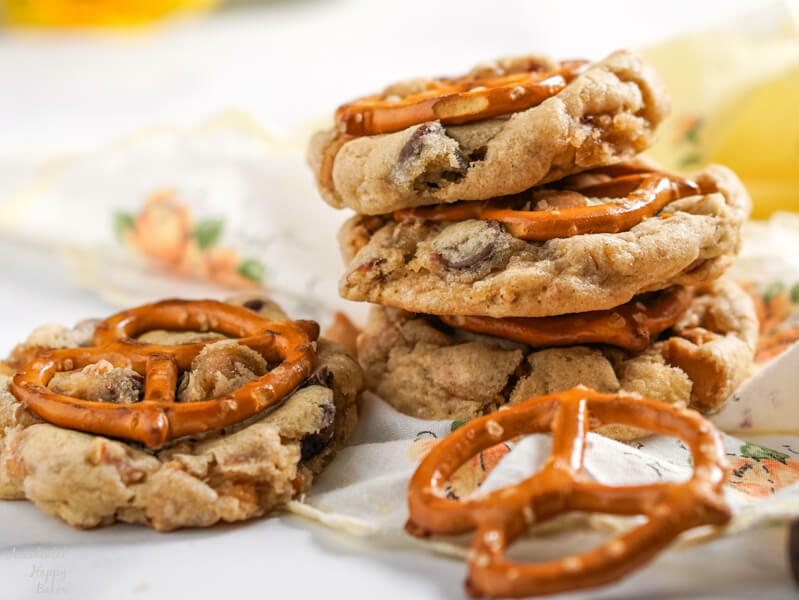 Peanut butter chips and pretzels are added to a chocolate chip cookie base for a sweet and salty, crunchy and chewy cookie. Preheat the oven to 350 degrees and prepare 2 baking sheets with parchment paper or silicone baking mats. In a medium sized bowl, cream together the butter and sugars. Beat until light and fluffy. Then add the eggs and vanilla, beating until blended. In another bowl, lightly stir together the flour, baking soda and salt. Gradually add the flour mixture to the wet ingredients, scraping down the sides of the bowl as needed. Stir in the pretzels, chocolate chips and peanut butter chips. Roll into 1 1/2 inch balls and place two inches apart on your prepared baking sheets. Bake at 350 for 9-11 minutes. 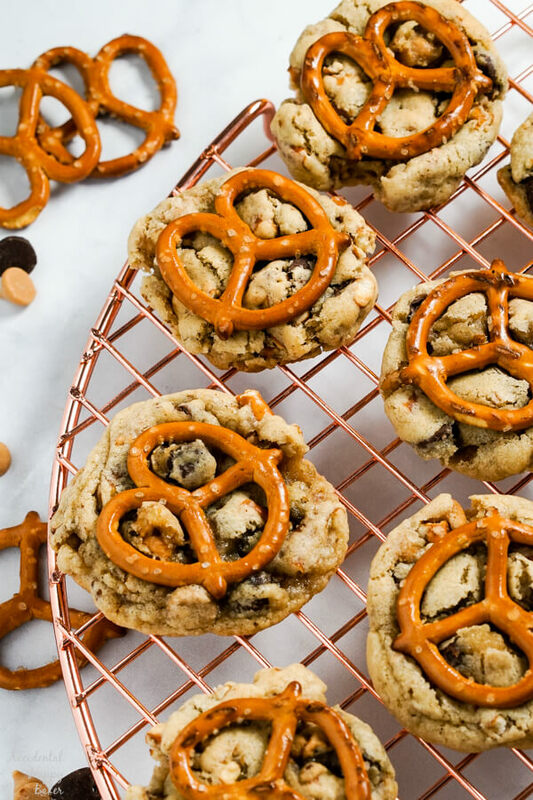 Immediately after removing from the oven, press a mini pretzel twist into the top of each cookie. Let cool on the baking sheet for 3 minutes and remove to a wire rack to cool completely. Did you make this recipe? 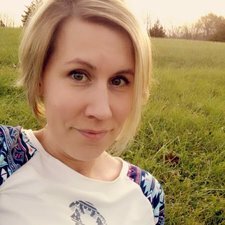 I’d love to hear what you thought! Please leave a review or join us over at What’s Cooking and show off what you’ve been making.